Hey guys, I know many of you are waiting on the kitchen reveal, and I was planning to get to it today, but time got away from me. So, I hope you will settle for a peek into the butler’s pantry. 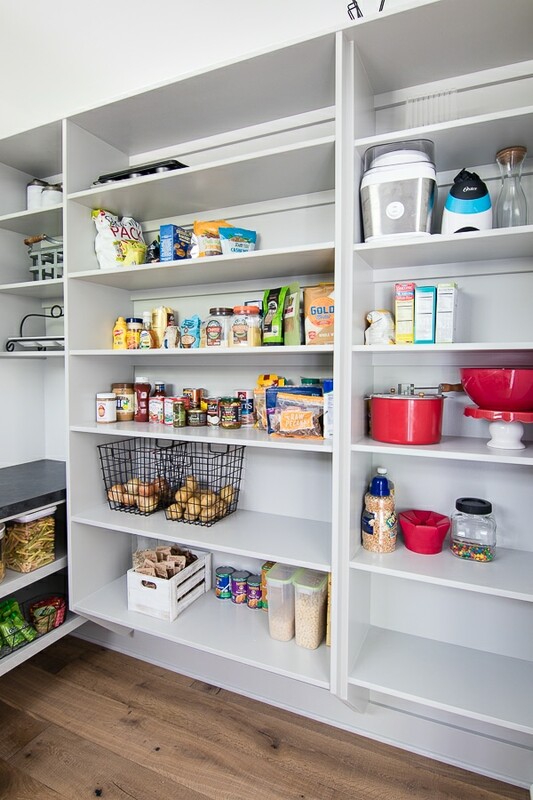 I have shared before that I hate clutter, and having extra stuff on my kitchen counters makes me especially crazy, so this pantry is the best! It’s still a work in progress as I really want to add wallpaper or tile in here, I just haven’t decided what exactly I’m going to do yet. I also want to take a trip to the Container Store on the other side of the state to get some more organizing stuff, but I’m off to a decent start. 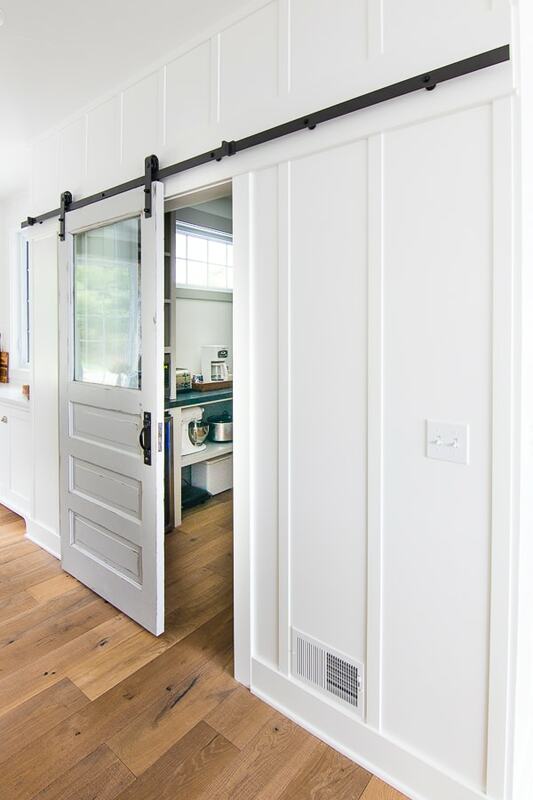 If you’ve been following along since the beginning of the building process, you will remember this space was originally supposed to be about half the size, with the other side being a coat closet in the entry. We didn’t have a coat closet in our last house, so I didn’t think we would need that space and decided to just make it all the butler’s pantry. In my head it wasn’t quite this big! When they framed it out and I could actually do snow angels in here (before they got the roof on), I thought I may have goofed a bit, but I actually love having this large space to keep everything tucked away in. I put all of my small appliances in here; microwave, toaster, mixer, all the big stuff that typically hogs up all the counterspace. The guys did a great job with all of these built-ins and shelves in here. I wanted a mix of pretty and practical useable space. I chose to do a door with a window in it to let the light in from the window to the kitchen. You may remember this old door that I picked up and spent days stripping all the layers of paint off. I concentrated on keeping this back wall filled with prettier things, so that when the door is closed it still looks nice through the window. On the left is the appliance zone. We scored a major deal on this floor model wine fridge and it was great to have the extra wine storage for all the summer entertaining we did. It’s also convenient when I’m hiding in here from the kids…I have everything I need, wine, chocolate, popcorn – the necessities. My kids hang out in here plenty too. I made sure to put all the kids snacks down low so they have no excuse to be “rock climbing” up the shelves. 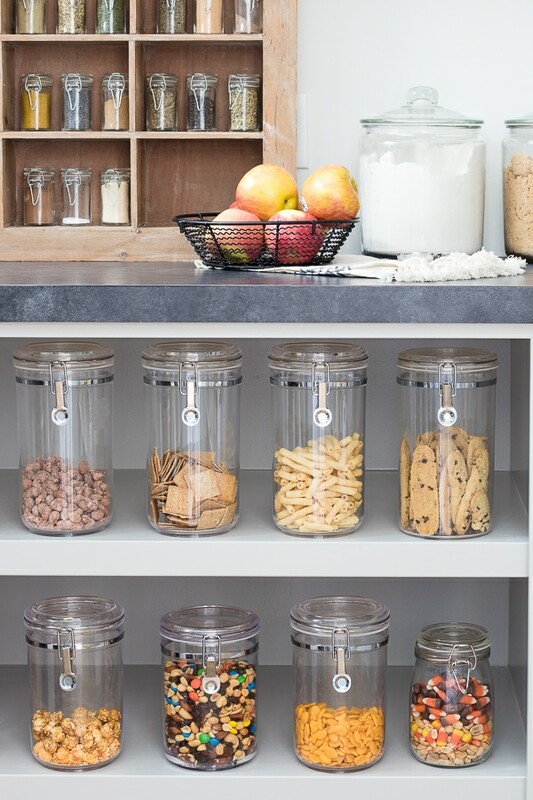 These plastic jars from HomeGoods have been awesome for keeping our snacks organized and fresh. Getting my kids to flush the toilet, let alone put a chip clip back on a bag is a minor miracle, but for some reason they are great about snapping these shut. That old wood display case used to be in our master bedroom at our old house, but it made the perfect spice rack for in here. I just grabbed these little jars from amazon and labeled the bottom to keep everything neat. Stay tuned for the kitchen and if you’ve seen any great wallpaper patterns that scream “pantry” let me know, I’m still on the hunt! Counter top – I can’t figure out the name of it anymore – sorry! Love everything you do! Great pantry…a dream design. One question, could the sticker inside the pendant peel off? It would make for a seamless finish…still amazing! All peeled off, just for you, good eyes ha! I just never noticed lol, this photo is taken at hip height so I’m not normally down there looking at the lights! Love this space! Can you share the source for your lidded baskets? I’ve actually had those for years, I think they were originally Target though? Okay. I’m so unworthy! How proud are you of this beautiful space? I can’t wait to see what wallpaper you’ll choose! Thanks Kay, it was definitely a challenge to mix practical and pretty in here. Oh my word! 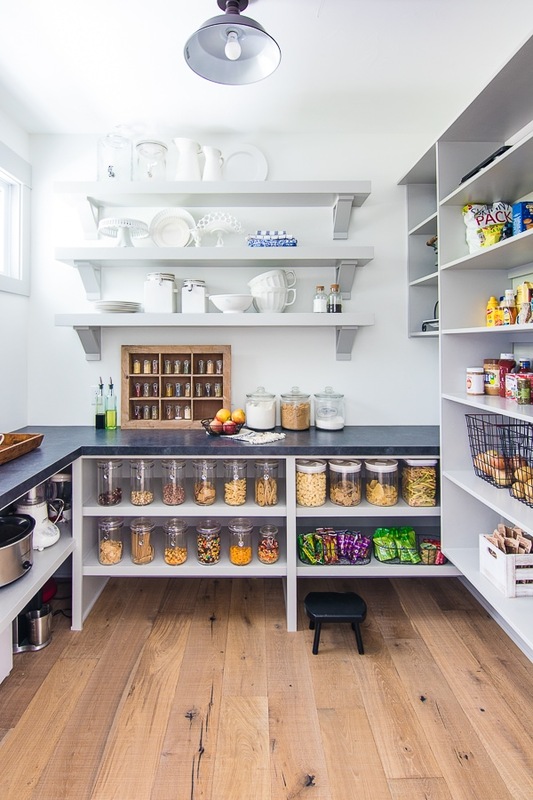 That is such an epic pantry! :) It is so organized and lovely. Where did you get the handle for the sliding door? oh shoot I forgot to link that, I think I found it on Houzz actually. How fabulous! I envy this SO MUCH! I am beyond impressed with your choices and the planning that went into your home. Everything is beautiful! Are you going to share your closet? That is another thing on my wish list…an awesome closet! OH my word my closet is a nightmare lol! Very nice butler’s pantry! 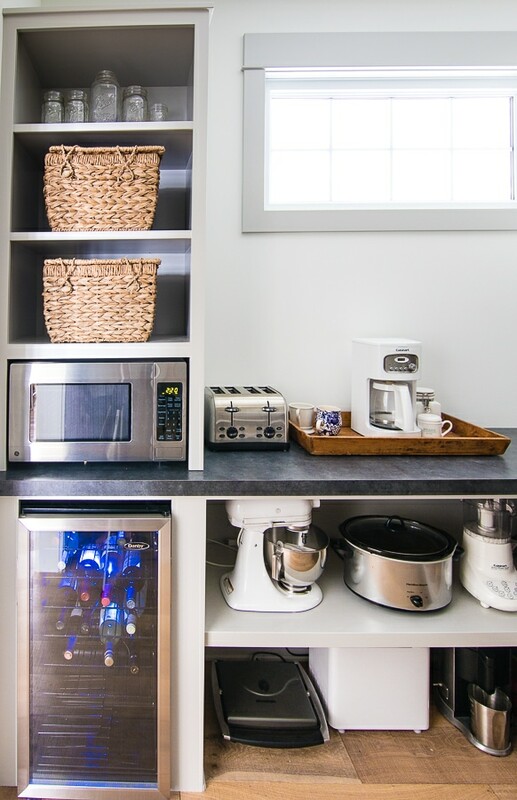 Do you make your toast and coffee in the pantry or just store the items and take them out when you need them? I just keep it all in the pantry, keeps the crumbs off my kitchen counters too! I even take my mixing bowl in there and put sugar etc in it when I’m baking. Thanks Norma, blessings to you too! Love your pantry! Trying not to be too jealous. :-) Here is some removable wallpaper that I LOVE and want to use in my mudroom. It has an old-fashioned vibe to me. Oh that’s such a fun pattern, thanks for sharing!! What a great space. Can I ask you about your paint finish. Do you go with the matte finish? The walls are matte and the cabinets and shelves are all satin. Absolutely SWOON-WORTHY!!!! I love it!!! I need to be half as organized as you . . . then again I don’t have a butler’s pantry lol!!! Your home is fabulous!!! Thanks for sharing your butler’s pantry as we PATIENTLY (not LOL!) wait for your kitchen reveal!!! Blessings from Missouri!!! Thanks Amy, I never thought a big pantry was a must have but now I love it. Kelly, your pantry is glorious and you will never regret allocating this much space for it. You’ve got enough room to replace that tiny foot stool with something larger – I have the Cosco Retro Counter Chair Step Stool with Slide Out Steps. Mine is red but I think it comes in white as well. It comes in handy when wee ones come to dinner, too. Plus, it would give you a more comfortable spot to hide out from your kids, lol! 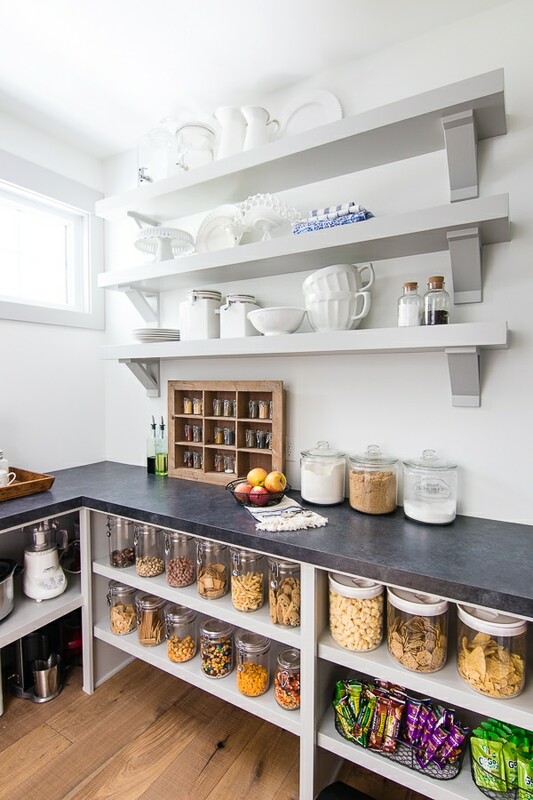 Love the fact that you designed counter space instead of just shelves. What a perfect place to prep for parties! 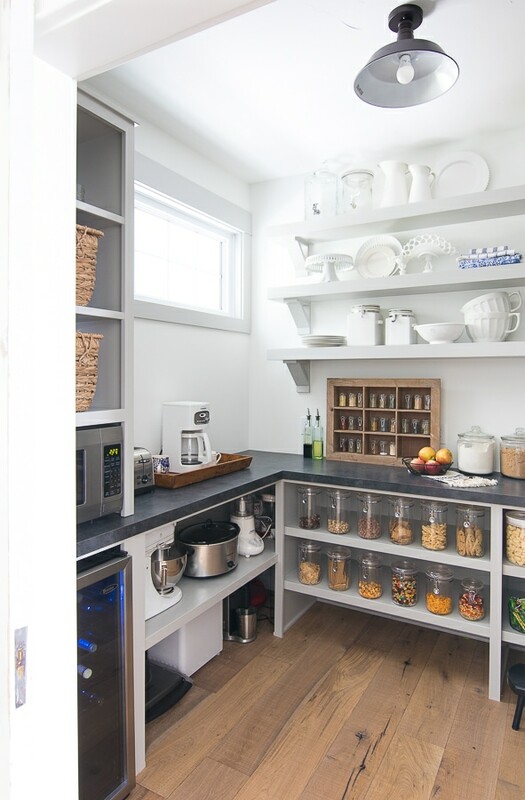 If you want a bit of privacy for the pantry without blocking the light through the window of that fabulous door, you can cut out tiny little shapes or words, etc., (PANTRY maybe?) on frosted contact paper before you apply it to the window. My friend randomly cut out tiny little stars for her rental bathroom window for privacy instead of a curtain. The process was tedious (she used an Exacto knife) but the end result was gorgeous! The view was obscured but it didn’t block the light and, of course, it’s removable. I now have serious butler pantry envy! What a great way to keep the kitchen clean and uncluttered. 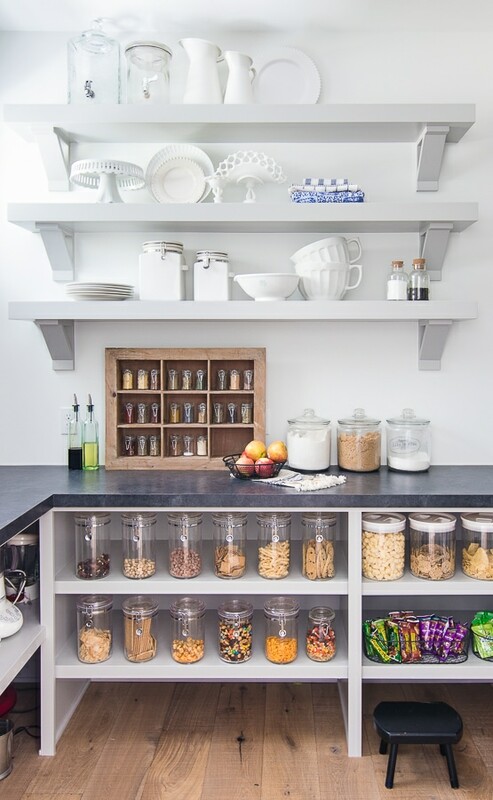 If I had this pantry, I would call it my dish pantry, and put my many sets of dishes and serveware on those shelves so I could look at them! Enjoy! Wowza, I’m sure I’ll be seeing that in a magazine soon! Such practical beauty! Gorgeous and so organized. I love it! Can you tell me where the wall shelves are from? The cabinet guys built them thanks! Wow!! This is wonderful, you remain my inspiration! Your design and choices are wonderful! How do you like your floors? (I love the look) What do you use to clean them? Hi Lisa, I will say they are a bit high maintenance when it comes to spills here in the kitchen. They hide dirt and dust so well everywhere and I just vacuum them and run a very lightly damp norwex mop over them once a week. But bc of the raw looking finish if you spill liquid on them you need to wipe up quickly so it doesn’t absorb and stain. So the kitchen is really the only place we have had some minor issues with it. That said I wouldn’t change using it I absolutely love the look and get a million complements on it! 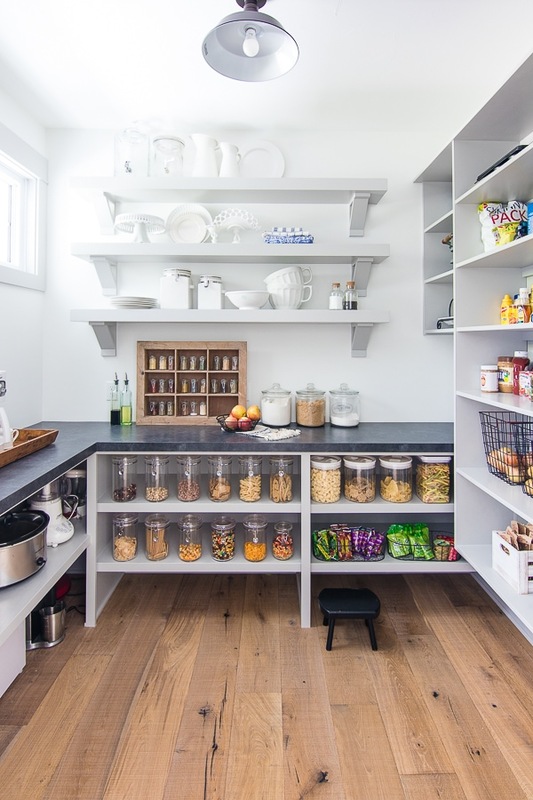 Beautiful pantry, love it! May I ask the dimensions? Do you think you would have had space for an extra fridge? thanks! Looking forward to more new home reveals. Hi ingrid we did contemplate putting a separate freezer in here and a full fridge in the kitchen but decided we didn’t need that much storage, it would have fit though! So much pretty organization!! I think your pantry is bigger than the kitchen project we are starting tomorrow 😆Have you been on spoonflower.com for wall paper? So many fun options and I think you can even design your own! OH I haven’t tried that, I’ll definitely check it out! Beautiful! I am currently in the deign process on a new build here in Michigan (Milford area). :) What are the dimensions of your new pantry? 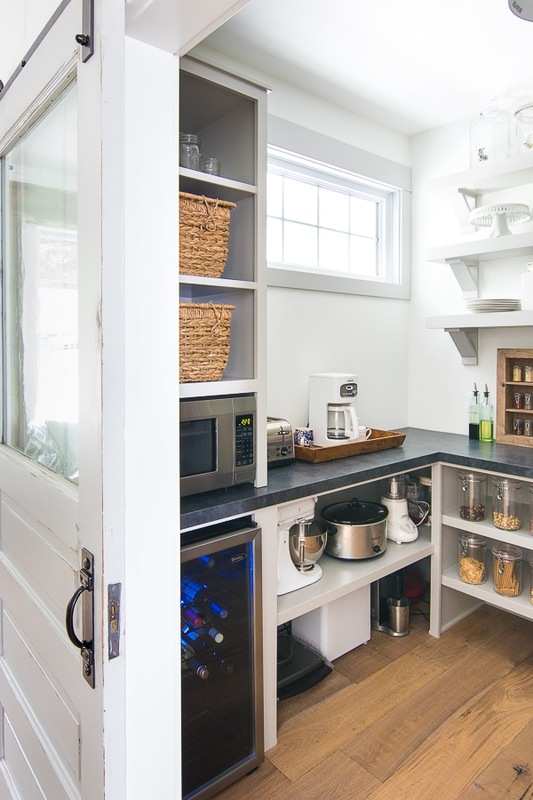 I am also looking to do a Butlers style pantry and this looks perfect. I think it’s about 8 x 10 thanks! Wonderful! Thank you. I am laughing as I read your kitchen post about “open but closed” concept! I’m going through the same thing. I *don’t* want my kitchen open to my Great room but I don’t want it “closed off” either. This is a lovely plan! Thank you for sharing. I love this! What material is the counter? I can’t tell if it’s a stone, or something else (concrete)? It’s actually just laminate that looks like soapstone. Thanks for responding Kelly, I really appreciate that you take the time to answer questions especially since Im in the process of planning our home during this time and love your design ideas and decor. I just wanted to let you know that I have been trying to subscribe to your blog for weeks now and I never am able to get a confirmation email that starts the subscription. I’ve checked my junk mail to make sure I havent missed the confirmation email and its not there either. Just wanted to let you know in case there is a problem on your end, and ask if there is another way I can/should subscribe? I will check back to this thread for your response. Thanks again! Would love to know square footage. It’s so hard to tell what’s too small and what’s perfect to accomplish what your going for. I think this is the perfect size girlfriend!! My husband thinks I’m insane for wanting to design out this space so detailed! Hi Tara this room is about 8 x 7 thanks!